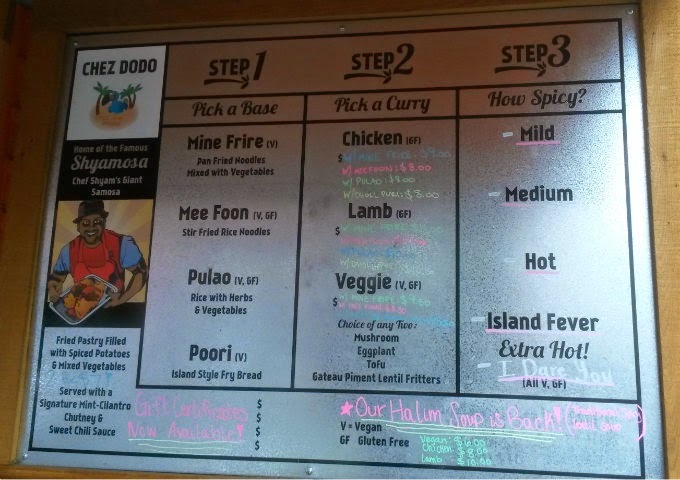 Since my original blog post on Chez Dodo, Shyam has moved his first cart to downtown Portland (SW 5th and Stark) and opened a second cart near 48th and Woodstock. 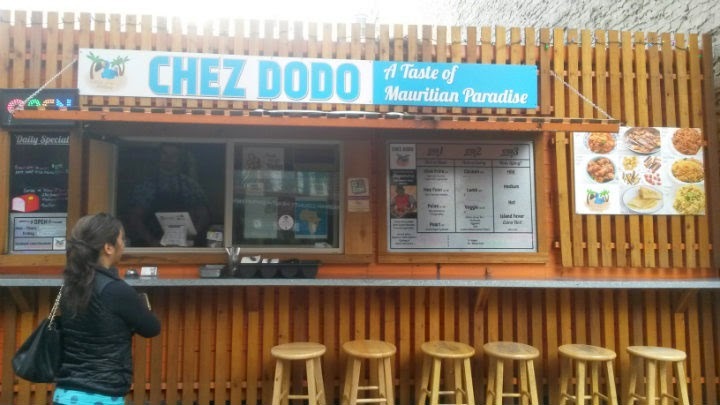 Generally, Chez Dodo is only open Monday through Friday, but I happened to see the downtown cart open on a Saturday in early February. Had to take advantage and score some Mauritian cuisine! I also brought a friend along, who was trying this food cart for the first time. 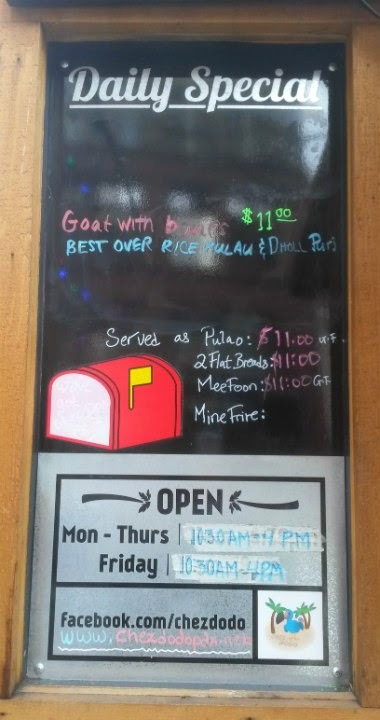 The menu is the same as my original visit, and the menu board is much easier to read. 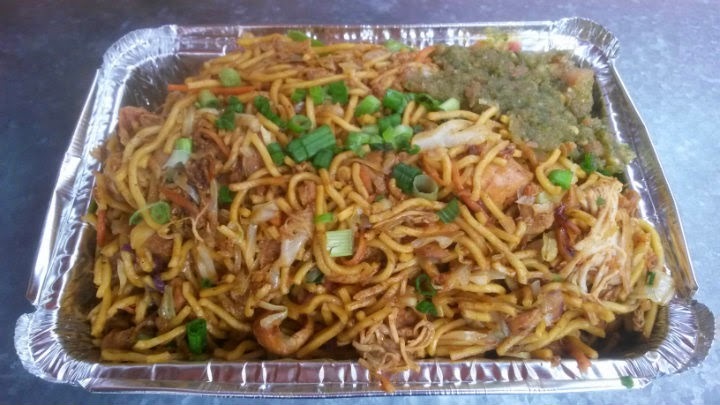 Pick a base (usually noodles or rice), a curry (chicken, lamb, or veggie), and the heat level (mild to very spicy). Appetizers include samosas and lentil fritters. 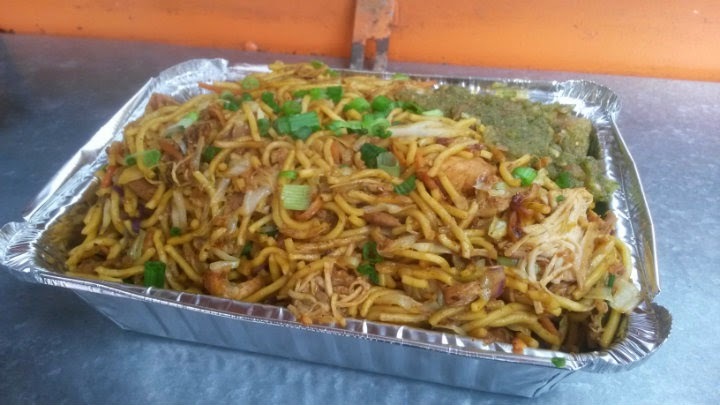 Like last time, I stuck with the Extra Spicy Pan-Fried Noodles and Chicken Curry, now $9. Outstanding, basically the same great food as before. Dark meat used for the chicken curry to add more flavor. To me, the two best parts about Shyam's food: (1) large portions; and (2) he knows how to make spicy food taste amazing. I could eat his food for days and hibernate with all that extra poundage packed on my body. 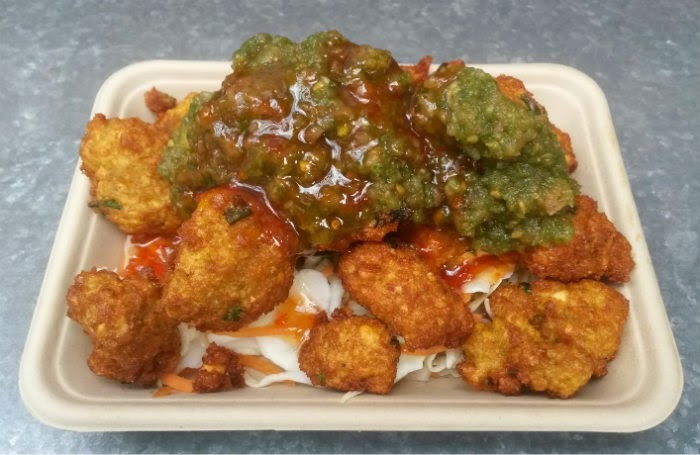 I also tried his superhot lentil fritters, made with habaneros, ghost peppers, Trinidad Scorpion peppers, and Da Bomb (an extract). It may sound like I ingested a nuclear product, but I still got to appreciate the crunchy fritter itself. Again, the mint-cilantro chutney and sweet chili sauce proved an excellent pairing.